Let's talk landscaping! Zimmerman Home & Garden Center offers landscaping services and products. 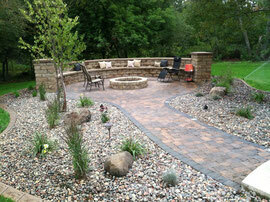 We can design your next back yard project and install it, without having you lift a finger. Landscaping mulch or rock can be used to accent trees or to increase the resale value of your house. We have a selection of Sand, Mulch, Rocks, Gravel and Black Dirt for you to use, beginning in early spring. You can pick it up, or we can deliver it to your house!